"When his mother Mary was betrothed to Joseph, but before they lived together, she was found with child through the Holy Spirit. Joseph her husband, since he was a righteous man, yet unwilling to expose her to shame, decided to divorce her quietly. 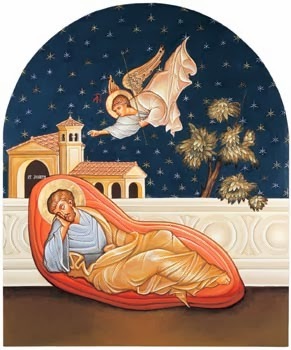 Such was his intention when, behold, the angel of the Lord appeared to him in a dream and said, 'Joseph, son of David, do not be afraid to take Mary your wife into your home. For it is through the Holy Spirit that this child has been conceived in her. She will bear a son and you are to name him Jesus, because he will save his people from their sins'" (Matthew 1:18-21). Ah yes, that "touchy" little situation. Thus we are introduced to St. Joseph, and the testimony of Divine Revelation to this greatest of saints after Mary herself is largely contained in these first two chapters of Matthew (along with some references in Luke 1-2). Indeed, this is one of his most important moments; it is the moment upon which his vocation is founded. What do we learn about him in this passage? Joseph her husband, when he realized that Mary must of been... well... unfaithful to their betrothal (which really surprised him since Mary had been so completely, astonishingly, immaculately good up until then) since he was a righteous man, yet [YET?] unwilling to expose her to shame, (in other words he was "righteous" but he wasn't like "crazy righteous" -- the Law said an adulterous wife should be stoned to death [see Deuteronomy 22], but he decided to ignore the Law and let it slide because he was a nice guy,) decided to divorce her quietly. (Mary had this story about an angel and a miracle and the Holy Spirit, but as Joseph himself said in Zeffirelli's movie Jesus of Nazareth [and he must have said it, because we saw it], "That's too much for any man to believe!" But still, he was a nice guy so he was willing to break it off quietly.) Such was his intention when, behold, the angel of the Lord appeared to him in a dream and said, "Joseph, son of David [why did he call him that? ], do not be afraid to take Mary your wife into your home. [PERIOD! That means the angel finishes his sentence here. Then he takes a deep breath and continues with the next sentence...] For (in other words, after have taken his deep breath, the angel proceeds to explain to Joseph what really happened, setting the record straight that Mary was telling the truth after all) it is through the Holy Spirit that this child has been conceived in her. She will bear a son and you are to name him Jesus, because he will save his people from their sins." At which point Joseph goes <FACEPALM> "If I had known, O angel, that Mary was really bearing the Messiah, the Son of God, in her womb by the power of the Holy Spirit, I would never have 'divorced her quietly'! Oh no, I would have taken her into my home and taken upon myself the earthly responsibilities of fatherhood for... you know... God Incarnate...."
Okay, JJ... enough snarkiness. What's the point? Well, the point here is that if I step back and examine what seems to be the common sense interpretation of this text, it starts to raise all sorts of problems. There's not a whole lot of bold type in that long paragraph. I have to make a lot of assumptions, which is not unreasonable since these assumptions are generally made even by theologians (generally, but not universally, and -- as we shall see -- there is good reason for a different reading). The interpretation fills in details that are precisely not mentioned in the text, but that seem necessary to make sense of it. The thinking is that Joseph is divorcing Mary for infidelity, and he is assuming that her pregnancy is a result of that infidelity (maybe she tried to explain it and he didn't believe her, or maybe she said nothing because of humility, in which case he still must have been somewhat flustered). He is a "just man," so he's not interested in getting revenge against the perpetrator, nor does he want to "press charges" according to the Law, but he also has no intention of covering the whole matter up by taking her in as his wife and presenting himself as the child's father. Then the angel appears to him and tells him not to be afraid to marry Mary because she is innocent and the child has been conceived by a miracle. The child, in fact, is the Savior. Problem solved. The marriage is back on. Problem solved? On closer inspection, maybe not. Actually we have several problems here. The underlying problem is that we interpret this whole event based on a presupposition that is not in the text. In fact, a closer look at the text reveals that our presupposition (that Joseph is divorcing Mary because he thinks she's pregnant by human agency) is not supported; indeed, the implications lead in another direction entirely. What I'm presenting here is theological and exegetical opinion, which has been much more precisely expressed by theologians and biblical exegetes (such as, for example, John McHugh, in his fascinating book The Mother of Jesus in the New Testament  and Giorgio Buccellati, longtime professor of Ancient Near Eastern studies at UCLA [see e.g. "The Prophetic Dimension of Joseph," Communio, Spring 2006] -- just so you know that my ramblings here are backed by scholarly heavyweights). Scott Hahn refers to the two opinions on this text as the Suspicion Theory (Joseph thinks Mary committed adultery until the angel reveals otherwise) and the Reverence Theory (which is... well, let's see). Scott himself doesn't "take sides" here, but (to my reading) he also leans in the direction of the latter theory (see The Gospel of Matthew, Ignatius Catholic Study Bible, p. 18). Let's take a closer look at this text. Mary "was found with child through the Holy Spirit." What does this mean? Exactly what it says (also in the Greek). Before Joseph took Mary into his home, she was found with child through the Holy Spirit. Once again, note well that does not say that she was "found with child and claimed that the child was conceived by the Holy Spirit." We might assume that the point here is that Mary was "found with child" and that Matthew just adds the Holy Spirit parenthetically. Is this assumption warranted? Let's examine further and see if we really need these invisible parentheses. Clearly, Mary is with child and Joseph wants to end the relationship. He has no choice but to divorce Mary, since the betrothal is already a binding legal commitment. But he doesn't want to "bring shame" upon her (stoning to death and all that), so he decides to do it "quietly." And all of these assumptions hinge on Joseph being a "just" or "righteous" man, which means that he is a man devoted to the Law (hence divorce) who is simultaneously a man willing to set the Law aside (hence "quietly"). The quiet divorce is something of a head-scratcher. Our lectionary translation gives us something that is appropriately bumbling: "Joseph her husband, since he was a righteous man, yet unwilling to expose her to shame, decided to divorce her quietly." Since? Yet? He was righteous, but...? And while we're at it, let's look at this term that Matthew decides to toss in here: dikaios. This is Greek for the Hebrew saddiq. Such a title is not awarded lightly in the Scriptures. This is a profound and full sense of righteousness, such as is attributed to Noah and Abraham. This is the kind of "justice" out of which radical foundations can be made. Here is Joseph the Righteous. And Matthew has introduced this term to explain to us (while also confusing us further) the reason why Joseph decided to be kind and merciful to his adulterous wife? Assuming that there's some wiggle room in the Law for this kind of arrangement (and we all assume this, of course), it would seem that a decent man could take this road without much heroic virtue. It hardly requires the righteousness of Noah or Abraham to walk away from an unfaithful spouse, without obligations and with a spotless reputation. The betrothed woman is allowed to live. We assume (again) that the "quiet" will succeed in smoothing over the situation for everybody, whereas in fact it refers only to refraining from filing a public charge. In such circumstances, the woman is still socially disgraced and even cast out of home and family, shamed for the rest of her life. It's not like she can go abroad for a year, have the baby, and then come back with nobody knowing anything about it. This is not the Hamptons. This is a Palestinian village. In 4 b.c. Everybody knows everything. As for Joseph? Not his problem anymore. Perhaps we can keep all these human assumptions (as many, but not all, church fathers and many, but not all, interpreters have) and still squeeze it all together and make it fit. It's all a big misunderstanding that the angel clears up, to our great relief, by telling Joseph the truth. If only Joseph had known from the start that Mary had conceived by the Holy Spirit, then it would have been.... ? What "would it have been"? What if? Consider this possibility: What if Mary told Joseph about the Annunciation, and Joseph did believe her? What if Joseph, the righteous man, totally, totally believed her? Here also, we are assuming (or hypothesizing) something that the text doesn't come right out and state. But why do we assume that it didn't happen this way? There is nothing implausible about this communication between these particularly extraordinary betrothed spouses. I would think that Joseph would be the first person she would tell. What we do know of Mary from the Gospels indicates that she was humble and obedient, yes, but not timid. She was also practical. This was something Joseph needed to know. I see no reason why Mary would not have told him the whole thing, right away. And how far have we really departed from the text in "assuming" this? Matthew 1:18 says "she was found with child through the Holy Spirit." Matthew is giving us Joseph's perspective here (is any other person mentioned?). So who "found" out that she was "with child"? Joseph. And how did he find out? Mary told him. Is it possible that what Joseph "found" was that Mary was "with child through the Holy Spirit"? "But, but..." we might say, "if he had known, there wouldn't have been any thought of divorce, right?" On the contrary. In these circumstances we have precisely what we need to make sense of the "quiet 'divorce' of the 'just man'" -- this is where lots of pieces fall into place in a way that I find compelling. It is precisely at this point that Matthew tells us that Joseph is saddiq, that he is righteous with that sense of awe and wonder at the mystery of God; in fact he is one in a million, the man to whom the Lord had already entrusted His most magnificent creation: the Immaculate Virgin Mary. But what has Mary just told him? She has been "overshadowed" by the Most High and has now become, in a new way, the dwelling place of the Holy One. (When Mary asked the angel, "How?" in Luke 1, she got a very clear answer.) Both Mary and Joseph recognized in these terms the references to the Shekinah, the Glory of God who descended upon the Ark of the Covenant, who dwelt in the Holy of Holies in the temple. Joseph learns that Mary is "with child through the Holy Spirit" and that she has received a new, divine vocation. But he has had no revelation from God, no new vocation that corresponds with Mary's. What can he do? He is a "righteous man" and is able to understand that Mary has become a bearer of God's Glory. Surely, the Lord will make His will known for Mary and this extraordinary child. He will assure that Mary is protected, no doubt by someone worthier than himself. The only role he sees for himself here is to release Mary from the obligations of the betrothal (yes, the word for "divorce" can be understood in this way) to make room for whomever God chooses. Of course, Joseph will do it "quietly," secretly, because it would be manifestly more than unjust to expose Mary to shame. It would be wicked. "Joseph, since he was a righteous man" (1:19) would never do such a thing. He will release her right away, and keep her secret to himself. For his own part, Joseph is filled with awe and humility. He is full of that eminently righteous gift which is the fear of the Lord. No doubt he wonders about many things, and is probably confused and "afraid" in the emotional sense. But above all, he is surrendering Mary to the mystery and the freedom of God's plan. This is his intention when the angel appears. And here more things start to make sense. The angel says to him, "Do not be afraid to take Mary your wife into your home." The "fear" indicated here is the kind that the human person has before the mystery of God. The "Suspicion Theory" has no way to explain this fear. If Joseph thinks Mary's pregnancy is ordinary, it's hard to see what he would be "afraid" of even in a purely human sense. He would be opposed to taking an adulteress into his house, not for any reasons of fear, much less the fear of the presence of God. He would be concerned for her dismal future. He would have no fear about himself; he has done the right thing. But the angel invokes that fear in the presence of God and relates it directly to Joseph taking Mary into his home. That would make perfect sense if Mary in fact has the presence of God within her in a wholly new and unimaginable way. But how do we account for the angel giving Joseph the news of Mary's miraculous conception in a way that seems "fresh" if he already knows about it? Isn't there a divinely inspired PERIOD that divides 1:20? "Do not be afraid to take Mary your wife into your home. For it is through the Holy Spirit that this child has been conceived in her." These two sentences do sound like the angel is relieving Joseph's "fear" by informing him that Mary's child is in fact of the Holy Spirit. But we've seen that this fact is the only meaningful reason for Joseph's fear in the first place. Here's where we must realize the limitations of translation. The New Testament was written in the common Greek of the first century, with no word spacing or punctuation. Many terms that have various possible renderings get standardized by translators for a variety of reasons. Frankly I'm not a New Testament scholar or a Greek scholar. But here I'm relying on John McHugh (see above) who is both. McHugh says that it is legitimate to read this verse in a different way, pulling out the punctuation that isn't there in the first place and using some unwieldy clauses which don't sound great in English but render the sense more accurately. The result is that the angel's words to Joseph actually emphasize that Joseph's knowledge of the miracle is the cause of his fear. What we should read here goes something like this: Do not be afraid to take Mary your wife into your home on account of the fact that it is through the Holy Spirit that this child has been conceived in her. Now that makes sense. And there is a hint here too of what the angel's real purpose is in this vision: "Joseph, son of David..." he says. It's interesting that this narrative begins at verse 18. Last week we read the first 17 verses, which are a genealogy from Abraham through David (the King to whom the promise of God is given) to Jesus. When I hear the genealogies being read, I am tempted to zone out. I am even tempted to open Matthew's gospel and just start at verse 18. But this genealogy does catch my attention (and might cause consternation) because after all these carefully recorded names we arrive at "Jacob the father of Joseph the husband of Mary, of whom Jesus was born" (1:16). Wait! If Joseph is not Jesus's biological father, then what good is the genealogy? In fact, it's a lot of good, and it sets the stage and indicates the focus of the narrative that follows. Kingly inheritance passes from father to son in the Hebrew tradition. Mary's lineage has no legal significance and it is the legal claim to be a descendant of David that is necessary for Jesus to inherit the Davidic kingship and fulfill the promise. But there was no human father! The inheritance can only be handed on if a descendant of David steps in and acts as father to Jesus (we say that Joseph "adopts" Him, but I'm not sure that we have an entirely adequate term to describe the sui generis role that Joseph is called to play). "She will bear a son and you are to name him Jesus" (1:21). Now we know what this angelic visit is all about. The angel is giving Joseph his specific vocation; he is conveying God's authorization (indeed His command) that Joseph enter into a unique service to this new Shekinah, this new presence of God in the world: that he take his wife into his home without fear, because he, Joseph, is the one called by God to take on this responsibility. And he is called to this because he is a "son of David" and he therefore passes on the earthly line of the Messianic king to Mary's son, to whom he gives the name of Jesus. Personally, I'm convinced. This has gotta be it. Remember that Scott Hahn called this the Reverence Theory, and I think we understand why. It's simple. It makes everything fit together. It's consistent with the details Matthew gives us and fits better into the context. It explains Matthew's statement that from the beginning Mary was "found to be with child through the Holy Spirit." It accounts eminently and in every respect for Joseph's title of saddiq, right in the place where Matthew introduces it (without resorting to casuistry about the Law, or a murky sense of what Joseph was up to or what human problem he was afraid of, or having to posit this odd, tense, and mistrustful beginning of the Holy Family). The "Reverence Theory" corresponds to the singular sanctity of the man, St. Joseph -- always obedient, always steadfast, always following God's will and trusting in His wisdom. That is the St. Joseph I know, and I have no reason to believe he was ever otherwise.